Sushant Anand, assistant professor of mechanical and industrial engineering. Sushant Anand, assistant professor of mechanical and industrial engineering, has been selected to receive the prestigious National Science Foundation Faculty Early Career (NSF CAREER) Award, which supports early career faculty who have the potential to serve as academic role models in integrating research and education and to lead advances in the missions of their department and organization. The award is the most prestigious honor for up-and-coming researchers in science and engineering. His preliminary work has been focused on water for applications like water harvesting, where water is collected directly from the air. To do this efficiently, a special surface is needed. “To increase the efficiency of water harvesting, you need to increase the efficiency of water drop nucleation so more water drops will form,” he said. “At the same time, you need to make sure the droplets leave the surface faster so you can collect more. For some time, I’ve been working on these surfaces called lubricant-infused surfaces. “The problem with these surfaces is extending their durability for considerable time is very challenging. For a variety of reasons, they lose the lubricant over a period of time, especially during condensation. These are lubricants that are immiscible with water, and small amounts of liquid are sheared off as water flows through them. Anand and his team found that if they took the same material and cooled down considerably (to -15 oC, for example), the drops displayed the same behavior. This came as a surprise because it implied that the materials are somehow melting the water drops, and the region around the water drops is melting, which can only happen if there is a heat that goes into the substrate to cause a 10-to-20-degree jump. The team tested some other materials and found similar behavior with varying degree of droplet motion on them. Anand proposed using this concept and materials to replace the existing liquid-infused surfaces. You could have a composite solid surface made of solid texture and these materials infused within the texture and operate them below their melting point so that the entire surface remains solid. However, when water drops condense on them they will become liquid around the drops. Anand received his Ph.D. in mechanical engineering from the University of Cincinnati, Ohio, in 2011, and did his postdoctoral work at MIT. He joined the MIE department at UIC in 2015. 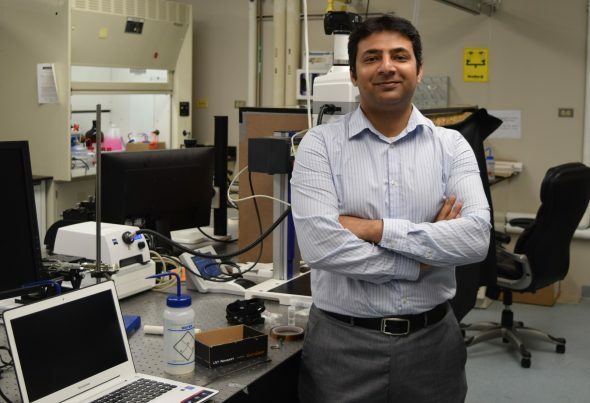 Learn more about his research and accomplishments at https://anand.lab.uic.edu.